LEXINGTON, Ky. (June 6, 2018) – UK HealthCare has been named one of the official sponsors of the Barbasol PGA Championship being held this July at Champions at Keene Trace in Nicholasville. The tournament, which will be played opposite the British Open, features such stars at Jim Furyk, Davis Love and Angel Cabrera, Davis Love III and Hunter Mahan (all are eligible to appear) competing for $3.5 million in prize money and 300 FedExCup points. Three of Central Kentucky’s signature companies as exclusive sponsors when the PGA TOUR comes to the Bluegrass on July 16-22, 2018. UK HealthCare has been designated as the Official Health Care Provider, Lexmark is the Official Printing & Imaging Solutions Provider and Lexus of Lexington will serve as the Official Luxury Vehicle for the tournament. As the Official Health Care Provider, UK HealthCare will provide first-aid services and sports medicine support at the tournament, but the overall sponsorship is much greater. 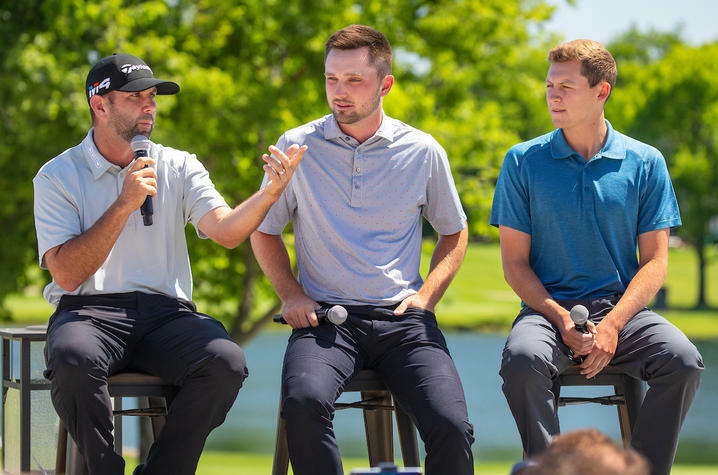 Through the partnership, the Barbasol Championship will engage and feature the hospitals and clinics, UK Athletics and the University of Kentucky as a whole. A key component is the designation of the Kentucky Children’s Hospital as a featured charity of the tournament and the beneficiary of the “Barbasol Championship Acoustic Jam,” a concert at the Lexington Opera House on Tuesday night of tournament week featuring six country acts, including headliners Billy Currington and Maddie and Tae. UK HealthCare includes UK Albert B. Chandler Hospital, Kentucky Children's Hospital and UK Good Samaritan Hospital as well as all and more than 80 specialized clinics, 140+ outreach programs, and a team of 9,000 physicians, nurses, pharmacists and other health care workers – all dedicated to patient health. “On behalf of UK HealthCare, we look forward to sponsoring and providing services during this exciting event coming to Lexington this summer," said Dr. Mark F. Newman, UK executive vice president for health affairs. ”In addition, we are honored to have Kentucky Children's Hospital as the benefactor and a featured charity of the tournament enabling us to highlight and recognize the extraordinary advanced specialty patient care provided at the region's only hospital just for children." In addition to its role as an active corporate citizen here in the marketplace, Lexmark also has deep ties to professional golf. The company is the Official Imaging and Printing Solutions Provider of the PGA of America, which oversees the Senior, Women’s and PGA Championships, and has provided services for the U.S.-based Ryder Cup events and the PGA Tour’s Genesis Open. "Lexmark and the PGA of America have been working together for a decade, since Lexmark first supported the 2008 Ryder Cup with printing technology and solutions," said Brock Saladin, Lexmark senior vice president and chief revenue officer. "We are pleased to continue that partnership here in the Bluegrass with our sponsorship of the Barbasol Championship. For the Barbasol Championship, Lexmark will have the same designation as the Official Imaging and Printing Solutions Provider and will provide printing technology from its Lexington headquarters and serve as the official sponsor of the tournament’s media center. The company, founded in Lexington in 1991, is a global imaging solutions leader serving customers worldwide. Lexus also has deep ties with golf and the designation as the Official Luxury Vehicle of the Barbasol Championship is a natural fit for the brand here in the Bluegrass. The Lexus ES 350 line is now produced at Toyota Motor Manufacturing, Kentucky (TMMK) in Georgetown and added 750 new jobs to the local economy and a $360 million investment in the plant when the line was added in 2015. “Naming Lexus as the Official Luxury Vehicle for the inaugural host year of the Barbasol PGA was a no-brainer for our brand, especially within the state of Kentucky. We are truly blessed to have TMMK in our backyard, and the privilege of showcasing some of the vehicles manufactured in Kentucky on this national platform is simply an opportunity we could not pass up,” said, Kelley Nalli, Chief Marketing Officer, MAP Group Companies, owner of Lexus of Lexington. Lexus of Lexington also will serve as the Presenting Sponsor of the tournament’s “Birdies for the Bluegrass” program, which will drive charitable giving throughout the Commonwealth through pledges for each birdie scored in this year’s tournament. The Woodhill Community Center, a primary beneficiary of Lexus of Lexington’s ownership group’s foundation, The MAP Foundation, also will serve as featured charity with the Barbasol Championship.